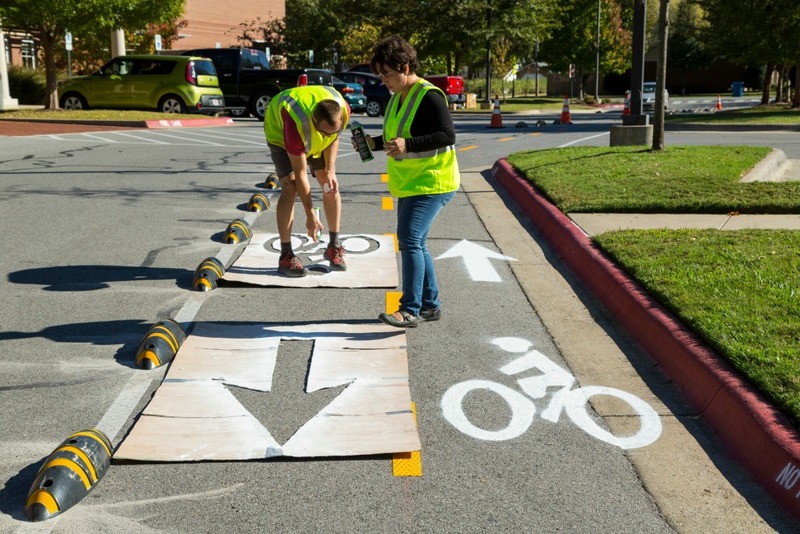 Street Plans was hired by Asheville on Bikes, Blue Ridge Bicycle Club, and AARP to advise the community in the temporary redesign of Coxe Avenue utilizing tactical urbanism in Asheville, NC. Street Plans will lead a public workshop on June 21st to further inform the community and local stakeholders about tactical urbanism and to plan and propose the specific elements of the project. The project will use temporary materials to test a reconfiguration of Coxe Avenue, a main thoroughfare through downtown Asheville, to better inform a more permanent redesign of the street in the future. The goal is to make the street safer for all users, especially pedestrians and bicyclists. Click HERE to read a full article about the upcoming workshop. Last week, Street Plans teamed up with inspiring youth leaders at a non-profit called Make the Road Connecticut and the public health department at Sacred Hearth University to demonstrate how some simple tweaks to street design can have positive outcomes for safety, aesthetics, stormwater, and placemaking. 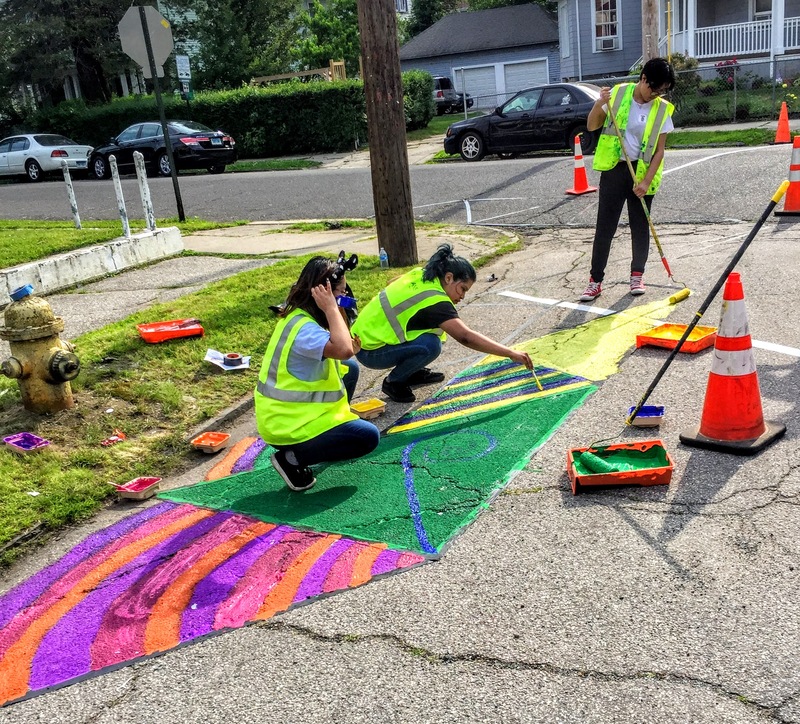 Youth leaders designed and painted their own curb extensions to slow traffic, shorten crossing distances, and add a pop of color to their walk to school. They also addressed 3 state reps including Steve Stafstrom to rally for improved bussing and walking infrastructure. As a sub-consultant to Fitzgerald & Halliday, Inc. (FHI), Street Plans has worked with the Village of Nyack to develop a Bicycle and Pedestrian Master Plan for the region. For Earth Day this year on Sunday, April 22, Street Plans conducted outreach by talking with residents and constructing a pop-up protected bike lane. Residents were able to experience first-hand the types of bicycle infrastructure that will be made possible by the larger master plan. Street Plans and the project team will wrap up the 6-month long study at the final Steering Committee meeting on June 18th. Click HERE to read an article describing more about the project. Last year, Street Plans was awarded a grant from the Knight Foundation to work with the City of Akron and University of Akron to design and construct a three-month pilot project along 9 blocks of Exchange Street in Akron, Ohio. Street Plans began the project last September and held the final community workshop and volunteer training session on Saturday, June 2nd. The final design, which includes a protected bike lane, is set to be built with community residents and city leaders between August 11-15. Click HERE to read a full article about the project. On World Bike Day, Sunday, June 3rd, Jersey City held their 9th annual Ward Tour. Over 3,000 cyclists came out for a 16-mile ride through each of Jersey City’s wards. 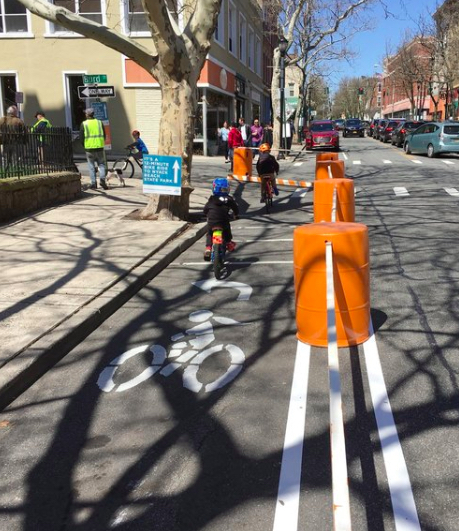 Street Plans is the primary consultant to the City of Jersey City in the development of their first ever bicycle master plan. On Sunday, Street Plans increased awareness for the upcoming plan, talking with cyclists before and after the event. Clarence Eckerson from Streetfilms is also working as a sub-consultant for the Jersey City Bicycle Master Plan and was there generating excitement and awareness for the plan through a brand new Streetfilm! Click HERE to view the Streetfilm.